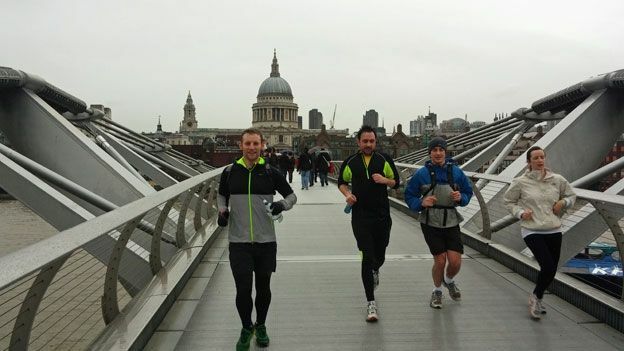 At the end of 2013, T3's Editor-in-chief and resident running man, Kieran Alger, set out to run thirty one half marathons in thirty one days to raise money for charity. With his mission now complete, he's here to share the running tech and clothing that helped him through the 406-mile December Half Marathon Challenge. Running thirty one half marathons in thirty one days is daunting. Not just mentally and physically but logistically too. It requires precision planning and a running kitbag full of gear that you can rely on. When you're spending two hours on your feet everyday, the smallest irritation can become a big threat. A rubbing shoe, a jacket that can't keep out the cold or a watch that won't find GPS can all put the challenge at risk. Finding the right kit for every eventuality is essential. You need good solutions to tackle everything from early morning hailstorms to pitch black muddy trail runs. You need reliable GPS trackers, heart rate monitors to keep you running in the right training zones and health checkers to help you spot when injury becomes a bigger risk. On top of that you need the best running shoes, the best running headphones and easy ways to keep on top of your nutrition on the road and afterwards are also vital. Luckily, technology has the answer. From winter-proof technical running jackets to specially formulated carbohydrate gels, the latest running innovations can help you focus on the job in hand, namely putting one foot in front of the other. Again and again. The Shield Flash makes being safe, seen and protected from the winter elements simple. It's brilliantly warm, water resistant and offers 360-degrees of ultra high visibility in the dark. The upper body and sleeves pack Storm-FIT 10 fabric for breathable wind-and-water-resistance, keeping water out and allowing sweat vapours to escape. Thumb loops also offer heart-warming hand toastiness while two well-placed pockets offer a safe haven for your smartphone. This 75g super light windproof jacket packs down small enough to fit into the smallest of running bags. Pertex Quantum ultralight fabric ensures plenty of windproofing and breathability, offering protection from the elements without the bulk. The biggest bonus is that it's adaptable. Paired with the right base layer it's also perfect for when the climate's a little warmer too. The ultimate waterproof running jacket, the Terrex Active Shell handles harsher winter weather with ease. It's heftier than the Innov-8 but lighter than the Nike Shield, with a three-layer GORE-TEX design that's brilliant against wind, without weighing you down. The perfect jacket for when you're not entirely sure what the British weather has in store. You'd be forgiven for thinking any old shorts will do but repeating the same movement for two hours every day means you're in big danger of chaffing in delicate areas. These Innov-8 shorts feature four-way stretch and inner full length lycra shorts for a more, ahem, comfortable ride. There's a handy rear zip pocket big enough to hold your bank card and some cash for emergencies too. If you're running thirteen miles every day on your way to work, your commuter running bag needs to be able to do two things. The first is deliver hydration, the second is have enough room left over for clean clothes. This two-litre North Face bag is a real winner. When its water bladder is half full you've still got plenty of room to stash those spare socks. Meanwhile neat little touches like anti-slosh technology, zippered hip-belt pockets and a magnetic clip for securing the drink tube are also a bonus. Pounding the payments in trainers that are over cushioned can do more harm than good, adding unnecessary weight over long distances. The FlyKnit tech works replacing the traditional panelled upper with a woven one, making the shoe lighter. The tightly woven polyester upper varies in density with heavier weave in areas that demand more support. The ultra-light upper is supported by Nike's Lunarlon cushioning system - lighter and supposedly more responsive than standard EVA soles. Knowing the terrain you're tackling and choosing the correct footwear is the difference between finishing or flaking out. The December Half Marathon Challenge involved a mix of trails and tarmac so a road-trail all-rounder was essential. The Salomon XR Crossmas 2's combine technologies for comfort and cushioning on harder surfaces, with durability and stability once you hit the more uncertain ground. They also boast easy-fasten laces which makes slipping them on and off far quicker, should you need to do some urgent foot first aid. Aside from the comfort of being able to call in back up should your Achilles go at mile six, packing a good smartphone is essential for tracking your runs with a GPS running app and for taking those all-important photos of early morning sunrises. The LG G2 does both with aplomb. The 13 megapixel shooter is great in low light, has optical image stabilization to cut out the shakiness and produces some fantastic Instragramable results. A fantastic GPS run-tracking app that comes in free and paid-for premium flavours on iOS and Android. It offers all the usual time, distance, pace and speeds stats as well as ascent, descent and maps of your routes. The Pro version also lets you race against your own times and offers heart rate monitoring with the addition of a heart rate chest strap. There's online community for added support too, including the option to have real-time pep talks from your running mates fired direct into your tired brain via your running headphones. When clocking up a certain distance is essential it helps to have a back up. The Polar RC3GPS is fantastically reliable when it comes to getting GPS signal and has a battery life that'll last a good week of solid runs. It also puts your vital stats on your wrist where you can see them, delivering live heart rate, pace and distance info in real time. It'll also tell you what type of training you've done after your run and the online tools help you monitor your training load so you don't overdo it. When you're taking on a feat of endurance like running thirty one consecutive half marathons it's vital you keep tabs on your body's reaction to all the exertion. Rapid weightloss and shifts in body composition can be problematic so spotting these changes is important. The iHealth Body Monitor is the ideal tool for early insight, giving you weight, lean mass, muscle mass, bone mass, body water, and visceral fat rating. Yes, these are pricey, but in our view you get enough features to warrant the extra investment. The tangle-free cord actually lives up to its billing – many don't – and while the sportclip design has been modified from the previous model, it still offers a secure fit. Sound is even better than before, keeping the excellent noise isolation and deep, intense bass of yore, but with added detail and clarity. Last but not least, with a hygienic, anti-microbial coating and sealed housing, they're easy to keep clean and sweat free. The result of an Adidas and Sennheiser tie-up, these in-ear buds combine great sound with excellent sport credentials. The cables are forged from ultra-durable Kevlar and definitely stand the test of time, while the buds themselves are sweat proof and fairly comfortable in the ears. The neck band is a killer feature, letting you drop your heapdhones around your neck at any point during a long run. The sporty addition to Dr Dre's superbly popular Beats line up, the Powerbeats are ear-loops-with-buds style. They're lightweight, comfortable and stay put while delivering decent sound. Technology doesn't just stop at the kit you wear, hi-tech sports science now offers nutritional support as well. Maxifuel RecoverMax sports drinks are designed to deliver a post-run hit to help you get back to your best faster, reducing stiffness and helping reovery. The specially formulated blends of highest quality fast acting Biomax™ whey protein, Maxcarb™ Carbohydrates, Glutamax®, amino acids and key nutrients allow you to repair muscle faster and restore energy after any exercise. Developed by Finnish sports scientists and recently launched in the UK, the CHECK helps you avoid over-training and reduces injury risk by giving you instant feedback on how hard to push. Electrodes attach to your wrist, sending electrical pulses through your nervous system to assess your physical state. It uses this data and fires the results to a paired iOS app to tell you if your workout could potentially result in injury. These little beauties offer a piece of the magic that helps Premier League footballers and Team GB Olympians recover quicker from gruelling workouts. Strapped to your legs, the Firefly fires small electrical pulses to stimulate muscles and get blood flowing better. They're clinically proven and help delayed-onset muscle soreness – i.e. feeling tender after exercise. The least tech piece of kit on the list but no less essential, this high-density foam roller is ideal for stretching and breaking down both soft and scar tissue by self massage. You supply the pressure and it helps banish muscle knots by increasing blood flow and circulation. Essential for avoiding calf injuries and runners' knee. Kieran Alger ran the December Half Marathon Challenge, completing thirty one half marathons in thirty one days to raise money for the Starfish Greathearts Foundation.